From a young age, Ian Paget has had an interest and passion for drawing and art. Over the past few years, he has become one of the best-known voices online when it comes to logo design. He now splits his time between being Creative Director at Advansys, a design agency working on e-commerce websites, and working freelance creating logos at Logo Geek. He has also built up a community of people who look to him for useful resources and inspiration when creating a new logo. It all started at his first job when he worked at a medical company. Mostly doing admin, he then helped with the illustrations for a poster, and he found within a few weeks he was being asked to help more and more and his job began to evolve. Rather than paying a lot of money for a freelancer, they gave Ian the chance to develop his skills. He was learning on the job, putting into practice at work what he’d read about at home, and allowed him to make mistakes and learn from them. From there, he went on to the web design agency and began to work on projects in his spare time. He is going to show you, that no matter your niche, it is possible to grow a large audience and become the expert everyone turns to. At night when he wasn’t working, Ian liked to have side projects on the go for fun. He took on a project with a group of friends, spending four years helping to create an iPhone game. When it finally finished, he vowed to no longer undertake projects in his spare time after his last one took so much effort. Within a few weeks, he was already getting bored and looked for his next project. At Advansys, his job occasionally involved making a logo, which was a process he quite enjoyed. And as creating a logo is a relatively short-term project, he gave it a go. It started off as a fun way of learning more and improving his skill. And using the SEO and online marketing knowledge he was gaining from work, he set about creating a website to simply document what he was doing. Ian spent hours coming up with lists of possible domains, trying to find one including the word ‘logo’ which hadn’t already been taken. When he found www.logogeek.uk it was available and ticked all the boxes. So he quickly registered it. Over the past few years, it has continued to grow. Rather than leave his job, he’s opted to work there part time, leaving him Thursday through to Sunday to work on Logo Geek every week. He manages to get a substantial number of inquiries as a result of Google searches, has a large social media following, and is an authoritative figure in logo design. When he first started this project, he had the plan of creating logos for free for the people he knew. But knowing how good he was and how much he enjoyed doing it, they began to pay him. And when he created a new logo, he added it to his website to make a portfolio of his work. Ian then started to branch out after being asked to make logos for people he didn’t know particularly well, and they were paying him even more. That’s when he realised that it was actually a way of making money. When he received his first inquiry from someone he didn’t know at all, who found him through Google, it gave him the kick he needed to actually think about turning it into a business. While his job was paying the bills, the money he was making through his freelance work was allowing him some extra pocket money. So to make even more use of Google, he started to write more blog posts centred around certain keywords in order to boost his results. At no point has he ever had to go asking for work, with people always coming to him. In fact, he now receives several hundred inquiries a week from people asking him to design them a logo. After building a website, he went on to create a Facebook page as well, posting good resources he’d found but was receiving very little engagement. Using 50% of what he earned from making logos, he decided to give Facebook advertising a go. That did start to attract people, but he found that rather than being potential clients, they were designers. Although it wasn’t the result he had hoped for, he enjoyed the processes of sharing resources online and found it fulfilling to help and engage with people like him. And by posting one thing a week, he was enjoying steady growth. Back at work, he was getting tips from the person who managed the company’s Twitter account about growing an audience. So he took what he was doing on Facebook to Twitter. One technique was to find people doing similar things to him and then following the people who followed them. That saw his audience grow by thousands very quickly, and best of all, they were engaged with what he was sharing. And it made sense because those people obviously shared similar interests. As it grew, he felt he needed to better serve them and began posting at least once a day. Four years later, he now has over 84,000 followers on Twitter. 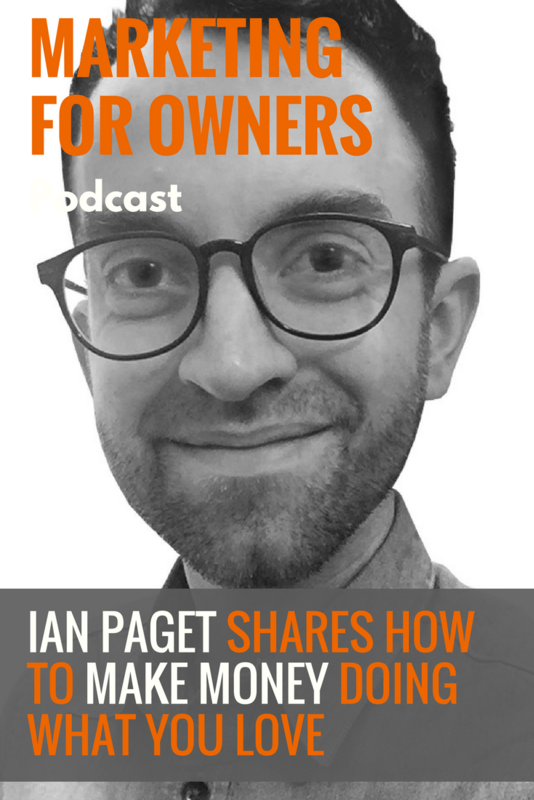 Ian no longer uses those tactics and now enjoys a following which is growing naturally by simply posting good content and being engaged with his audience. He shares only content related to logo design as, after all, they’re following an account called Logo Geek for a reason. And he doesn’t just share content he’s made, but also blogs and articles by other people; even his competition. In the end, it all helps him to come across as a knowledgeable expert. He has become the person people turn to when they want to know about logo design. And as the expert, he is also the person they want to hire to make their logos. It all started by sharing the things he found interesting. As a result, he was then asked to judge a logo competition. As a partner, the authoritative website it was for put his logo and website link on the bottom of every page, and as a result, he shot straight to the top of Google. Even though it was only brief, that traffic spike got him excited about the potential as during that time he also had a spike in inquiries. People recognised that he had influence, but it took a while for him to have the confidence to believe that himself. When he did, he became more proactive in trying to be involved in competitions and events, having the proof of his ability. After reading Gary Keller’s The ONE Thing book, Ian now has a ‘somewhere out there’ long-term goal to be seen as the go-to person in the world for logos and to have books, training, and events as part of the Logo Geek brand. Take a look at a selection of the work he has created at Logo Geek. The website also has resources to help you with your own logo design, as well as a wealth of blog posts too. You can also grab Ian’s free eBook for 50 of the best logo design tips from the pros to help you out too.